A long-time customer of Velocity Factor brought us back his beautiful Lexus IS-F to get more upgrades beyond those he received initially. Previously we did a series of such upgrades including a custom designed, one-off carbon fiber aero kit. While the car looked incredible, the customer wanted to have his vehicle stand apart even more! The first solution to this was changing his stock wheels for a set of custom wheels and as one of South Florida’s preeminent dealers for top-quality aftermarket wheels, we had a great selection in stock to choose from. Please see below for some pictures of his IS-F before we did this next round of upgrades. The first step was addressing the suspension in installing a set of TEIN S Tech Lowering Springs which dropped the ride height just enough to lose the unsightly “wheel gap”, while increasing the handling prowess by lowering the car’s center of gravity. When it comes to TEIN you’ll be hard-pressed to find a better quality product at a great price-point. Once this step was complete, all of the factory TPMS (Tire Pressure Monitor Sensors) were transferred from the stock wheels to a beautiful set of RAYS Gram Lights 57Getter’s. These wheels were finished in a custom-painted Bronze to make them really stand out. The Gram Lights line of wheels from Rays Engineering are best described as those having a classic wheel style with a futuristic flare. They not only look incredible, they’re also extremely light weight. When reducing unsprung mass (weight) at the four-corners of the car the results are improvements to handling, braking, and acceleration alike. The laws of physics always apply and less weight is always better! Prior to having the wheels installed Velocity Factor refinished the factory brake calipers with our “Caliper Magic” process. This customer wanted the calipers finished in blue to match the Lexus ‘F Sport’ logos that come on the vehicle. As the IS-F comes with factory Brembo Brakes, we were sure to keep the calipers looking factory-fresh with the proper Brembo logos covered in a high-temperature clear coating in order to protect the finish. Have a look and see the end-results for yourself! With those items addressed, the customer had one more request; extra fog lights to be added to the front of the vehicle. Being extremely detail-oriented, the customer specifically let us know that he didn’t want lights that would just bolt up to the bumper or otherwise look out-of-place. We at Velocity Factor knew just what to do and custom-mounted a set of PIAA fog lights recessed into the front grille of the car so they’d have a factory installed look. Once again, have a look for yourself to see the end result which is nothing short of perfection! The job was now complete! 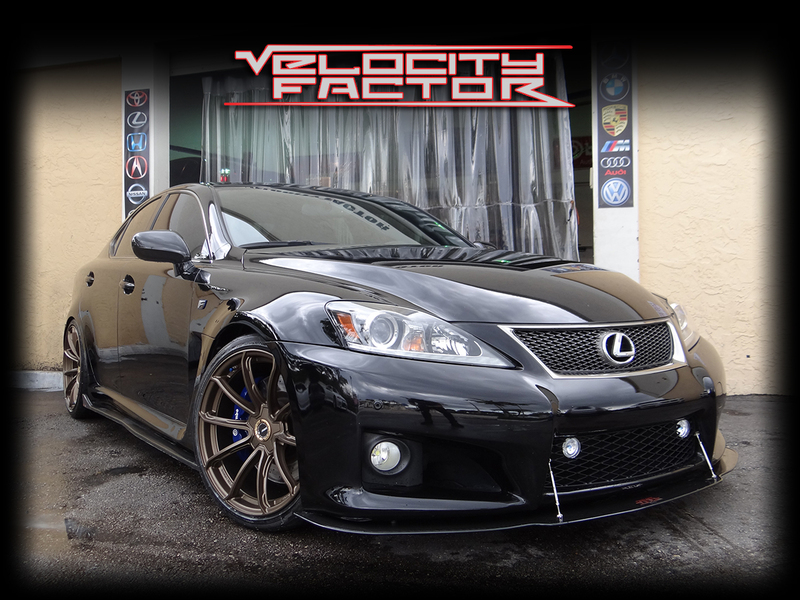 Another happy Velocity Factor customer back on the streets of South Florida in one of the nicest looking Lexus IS-F’s you’re likely to ever see. With the combination of TEIN Lowering Springs coupled with more aggressive, yet classic-looking aftermarket wheels in the proper size and offsets this IS-F turned out stylish, proper, and certainly more aggressive while maintaining a clean and sleek appearance. When it comes to selecting the best looking wheels with the perfect sizing and offsets no one does it better than the expert staff at Velocity Factor! Let us help you transform your car from ordinary to “extraordinary”! Please feel free to contact us at (561)-395-5700 or stop by during business hours. Velocity Factor is open Monday through Friday from 10am-6pm and Saturday’s from 12pm until 4:30pm. We’re located at 980 N. Dixie Highway in Boca Raton, Florida. We can also be reached via email at sales@velocityfactor.net and look forward to working with you!